Wi-Fi extenders are also called boosters and repeaters. All those terms are appropriate names to describe a piece of electronic equipment that expands the coverage area of your internet. A Wi-Fi extender accepts the router’s Wi-Fi signal and rebroadcasts it to areas beyond where the router will reach. Getting a Wi-Fi extender means that you get rid of those annoying dead spots in your internet coverage. If you thought that there was no fix for Internet dead spots for large spaces, thick walls, and above or below floors, a Wi-Fi extender would solve your problem. Even if your router reaches to the far corners of your home or office space, routers that don’t extend a signal far enough will make your internet signal weak or spotty. In these situations, Wi-Fi extenders come to your rescue. For the best results, set the router in a location where the signal will reach most places in the building or desired internet space. Place the extender within the router signal and within proximity of the area where you want to extend the signal. The extender has software that will scan the area for a strong Wi-Fi signal. You’ll get the best results with a double band extender. Single band extenders use the same frequency to get the signal as to transmit it. Narrow bandwidth drags down the throughput which makes your speed slow down. Double band extenders grab the signal on one band and transmit it on the other band. Some Wi-Fi extenders work as an additional WiFi access point for greater flexibility in system design. 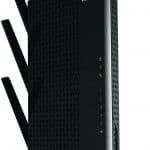 (Editor’s Overall Choice) – The Netgear EX6200 (AC1200) is a dual-band Wi-Fi range extender that does double duty as a second Wi-Fi access point. It’s a powerful extender that offers up to 1200 Mbps throughput. You can expect this Wi-Fi extender to extend your signal for several hundred more feet, and probably the maximum of 450 sq. ft. The EX6200 gets its high power and fast speed with a dual-core processor, high amplifiers, and two high-gain 5dBi antennas. It has five Gigabit Ethernet ports, which are significantly faster than the Fast Ethernet standard. The USB port lets you share media files across your network. It also has the latest technology that allows you connect to newer mobile devices with the same technology. This Wi-Fi extender has plenty of features, and it’s still ultra-easy to set up. 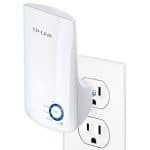 The WPS button lets you connect the extender to your router in short order, by pressing the WPS button on the extender, and then pressing the WPS button on your router. The devices sync to each other in seconds. If your router doesn’t have the WPS button, you can still sync the devices by reading the instructions in the manual. The NetGear EX6200 works in smaller and larger locations. 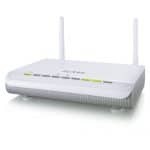 It has a lot of features for the price tag, making it one of the best Wi-Fi extenders available. This Wi-Fi extender is one of the larger models on the market, so if you are interested in a space-saver unit, this one may not be for you, although you can position it horizontally or vertically on a flat surface. The Netgear EX6200 has just one more downside, and that is the level of technical support. You get live chat and email help, along with your user manual, but you only get phone support for up to 90 days. 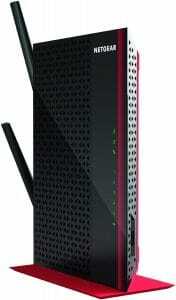 The Netgear EX6200 does everything that you need a Wi-Fi extender to do and more. With good range, high power, and fast speed, it’s worthy of one of the best Wi-Fi extender reviews. The TP-Link RE450 has the dual band technology which gives it stellar performance at short and long ranges. Unlike many competing products, this Wi-Fi extender is compatible with the MacBook Pro computer. This unit has a simple WPS setup. Just plug it into an outlet that is close to your router and wait for the power light to turn blue. Next, you press the WPS button on your router and then press the button on the TP-Link RE450. The units sync when the ring changes from a blinking blue to a solid blue. Once it is set up, move the extender closer to the area where you want to extend your signal—about halfway between the router and your dead spot. If the ring turns red, you won’t get a good signal. Move it back to an area where you can get the blue ring. The setup shouldn’t take longer than a few minutes. If your router doesn’t have the WPS button, the manual explains how to use your computer or mobile devices to scan for available networks and apply security settings. The TP-Link RE 450 lets you use your computer or mobile device to view your network status and create SSIDs for both frequencies. It also gives you the capability to select a security protocol and assign passwords for each band. Whitelist or blacklist modes to control which devices can use your extended network and upgrade your firmware. About the only negative with the RE450 is that the larger size blocks use of your outlet. It doesn’t have an AC pass-through, so you won’t be able to plug anything else into the same outlet. The TP-Link RE450 gives you all of the speed and performance you could want in a dual band Wi-Fi extender. With excellent range and added security features, this unit is one of the best Wi-Fi extenders, and it’s a strong model for competitors to beat. The TP-Link WA850RE N300 is a viable option Wi-Fi extender for smaller spaces. It does quick work of extending Wi-Fi range. It’s a smaller sized unit on the lower end of the price bracket, to it is appealing to the thrifty conscious buyer. This Wi-Fi extender is small enough to give universal wireless range while improving the signal strength of your existing wireless network to get rid of dead zones. Mount it on the wall so that it will be out of the way and inconspicuous. Use the Ethernet port to act as a wireless adapter to use a wired device as a wireless device. 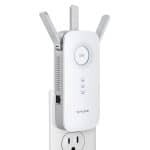 This Wi-Fi extender has a Wi-Fi booster for use with mobile devices. The WPS button setup is easy enough for anyone to get started. Just plug the extender in, and the wizard guides you through the rest of the process. Once the unit has been set up, you can move it around the house or office space, and it will retain its settings. Unplug it and move it around until you are sure that you have eliminated all of the dead spots. Use your laptop or another computer to manage filtering and the rate of throughput data. Connect up your printers or media TV using the Ethernet port. The TP-LINK TL-WA850RE N300 is one of the best wifi range extenders with a lower-end price. The design is one of the chic and stylish models, which will fit in nicely with your décor. It’s a smaller size that gives good speed and range. It’s not the best unit for everyone, but it works well for those that need a good, basic Wi-Fi extender. (Editor’s Single Band Choice) – Extend your Wi-Fi range up to a full 450 feet for your wireless router or access point, and it gives you the capability to manage it remotely from your home, office, or even when you are traveling. Log in to turn it off or on, change the settings, let you see who is using your wireless system, and disable unauthorized users with ease. The safety features of the Hawking HW2R1 Safety are second to none. It comes with a firewall, demilitarized firewall, IP address filtering options, system access control, and network address translation. These features help you keep your network private and secure. Make sure that your current router works with the Hawking HW2R1. Your router will need to be a B, G, N or AC Wi-Fi device, to connect. The biggest negative of the Hawking HW2R1 Wi-Fi extender is that it has limited throughput. The 2.4GHz single band doesn’t allow the unit to send and transmit signals at the same time. Support is good but doesn’t rival its competitors. Contact the support team by phone, email, or an online contact form, but you won’t find a live chat option. The Hawking HW2R1 sets up fast within a couple of minutes using the WPS technology. It’s a large unit with three antennas that put out a long range of about 450 feet. Having five Ethernet ports gives you lots of flexibility to connect other devices. 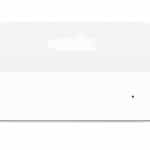 (Editor’s Budget Choice) – The ZyXEL WAP3205 has a lower-end price of Wi-Fi extenders. It’s a small WiFi-extender that comes in a classic black case with gray accents. Using the software, you can operate the unit in four separate modes with differing functions from your home computer screen. This unit uses N technology, but you can also use it with B and G routers. This Wi-Fi extender has dual bands for capturing and sending signals separately. Another nice feature is that it works as a wireless access point in addition to using it as an extender. The WPS button facilitates an easy setup, and the status lights signal any trouble at a glance. The power button lets you shut the unit down when you are not using it without having to unplug it. The ZyXEL WAP3205 Wi-Fi extender lets you manage your device on the go using the remote function. Using your IP address, you can change the settings, filter out addresses, and learn if anyone else is using your network. Users will be happy to find that it comes with a support CD and a quick-start guide, in addition to the full manual. You can also download the full manual from the ZyXEL website. The manufacturer site also includes some helpful FAQ’s as a resource for quick answers to common questions. The ZyXEL WAP3205 Wi-Fi extender has a lot of speed and power for a lower end Wi-Fi extender. The dual bands give a good range with a strong signal. The ZyWEL WAP3205 is a user-friendly device that has two antennas and a compact size. Two Ethernet ports give you some flexibility to connect it with other devices. Securifi responded to the user need to the user’s need to manage the Wi-Fi extender right from the source, rather than using a PC or Mac to set it up and manage it. Securifi developed touchscreen technology to make installation, setup and accessing your network as easy as using a tablet. At first glance, the unit looks like the mini version of Microsoft Windows tiles. The Securifi Almond is stable and reliable. Its small size extends a Wi-Fi range of just over 300 feet, but it works optimally at about 100 feet. It also has three handy Ethernet ports for connecting to other devices. 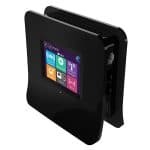 Use the touchscreen and the tiles will let you change all of the basic settings of the router including the Wi-Fi network, Wi-Fi protected setup, use as a wireless router or Wi-Fi extender, upgrade its firmware, and more. The Securifi includes a few security features such as WEP, SPA, and WPA2. The touchscreen works for most basic things, but it won’t let you change the settings for port forwarding, content filtering, or the firewall without using the Almond’s Web Interface. Point a browser to the router’s default IP address and make your changes that way. The Securifi Almond has a sleek-looking appearance that you’d expect to see from a Wi-Fi extender. It’s a good little device if you are looking for easy setup and ease of use and you don’t need to extend your signal very far. The higher price on this one is more reflective of the touchscreen than actual function. Apple offers up its version of a Wi-Fi extender with the Apple AirPort Express. Apple gave their extender the more efficient dual-band frequency with two antennas. This extender is a combination router and extender in one. Having dual band frequencies gives it good speed. The Apple AirPort Express is small and inconspicuous which won’t detract from your interior design aesthetics. Despite the small size, it gives you the ability to turn off the booster to use it as a router, but the size doesn’t allow for more than one Ethernet port, limiting its use with other devices. One of the biggest faults in this design is that the range is poor as compared with other similarly priced Wi-Fi extenders. 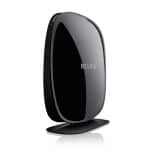 When it’s being used as an extender and connects to another router or access point, it is only able to extend the signal to about 150 under the ideal conditions. Technical support is also lacking for the Apple AirPort Express extender. Apple doesn’t offer live chat or email support, and you only get phone support for the first 90 days. You will get a handy user manual, but you won’t find FAQ’s. This palm-sized Wi-Fi extender gives good speed for the short range. 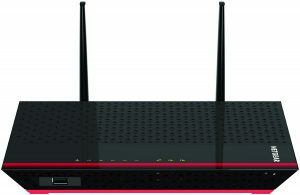 Dual band frequencies give it good speed and performance, and the combination router and extender give it versatility. 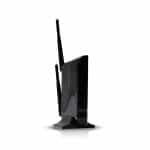 The Netgear Nighthawk EX7000 is a top performing Wi-Fi extender with dual band frequencies and three antennas. If you need an extended range, you can replace the antennas with high gain antennas. The Nighthawk EX7000 is a medium-sized unit with a sleek, black casing. It gives excellent speed and reliable signals with a range up to 165 feet. This unit has five Ethernet ports and a USB port, which gives the flexibility to customize your setup. Another nice feature of this model is that it has configuration screens that make it easy to change your settings, adjust your transmission output, see who is connected, and set an access schedule for children. The analytics section shows you your signal strength, the load on your channels, and the existence of other networks. The Netgear Nighthawk is not perfect in every realm. The extra features like the five Ethernet ports make it too bulky to plug it into an outlet without the use of an electrical adapter. Netgear doesn’t fare as well with the Nighthawk with ease of setup as its competing models. You will need to create an account with Netgear. After that, you need to make a Wi-Fi connection between the EX7000 and the host router by pressing the WPS button. You can also use your computer to access the Smart Setup installation program and select usage as an extender or wired access point. The slightly more difficult setup won’t bother users with technical aptitude, but it may give beginners some initial trouble. Netgear’s Nighthawk is best for tech-savvy users that know how to use its excellent range and solid performance efficiently. Despite the top performance and functionality, it’s liable to frustrate and confuse some users. The Belkin F9K1106 model is a compact extender with fast speed and a range increase of up to 300 feet, making it a solid competitor. Its dual antennas are housed discreetly inside the unit. The unit has an elegant appearance that blends in nicely with your interior’s design aesthetics. Belkin’s F9K1106 model is backwards compatible, so it interfaces nicely with older models. While it interfaces with older technology, it may not function quite as efficiently as when paired with newer devices. The dual band frequencies give it excellent speed and overall performance. The biggest downfall for the Belkin F9K1106 is that you won’t have the ability to manage your system remotely. If you connect to a wireless network, you can manage your settings online and adjust your security settings. Users will appreciate the enhanced speed and long range of this model. If you don’t mind the absene of remote access, this model has everything else you need in a solid-performing Wi-Fi extender. (Editor’s Choice for Security Features) – The Amped SR300 offers a solid performance for a single band Wi-Fi extender with a speed of 300 Mbps. It is backwards compatible with older devices and has some useful features like remote management and good security. The Amped SR300 sits nicely on your desktop, or it can easily be wall-mounted. Either way, it increases your Wi-Fi range up to 300 feet. Set up your system using the WPS button or configure it manually using your computer. Technical support is readily available if you have any difficulty. This unit works well for users that desire the capability of remote functionality. You can schedule your wireless booster to be turned on or off, restrict access, and perform other functions anywhere that you happen to be. This unit also incorporated several security features like WPA, WPA2, WPS, and V WEP for extra security. The Amped SR300 is a good unit that is priced in the middle range with the best in security features. If you’re looking for a Wi-Fi extender that has a solid performance and don’t mind the single band frequency, this could be an excellent choice for your needs. One of the first considerations in selecting the best Wi-Fi extender is how quick and easy it is to set up. Most of the Wi-Fi extenders in this review are very easy to set up, even for a beginner. Most use the WPS button and also have the capability to set up the extender using a computer and internet browser. Just be aware that you will need to know the SSID of your existing Wi-Fi and your password for it. The dual band technology is far superior to the dated single band units. Dual band frequencies allow the signal to be picked up on one frequency and sent on another frequency. Having a dual band Wi-Fi extender means that you will get better speed, and usually longer range. You can usually expect to pay more for dual band extenders, which are well worth their price tags. Be aware that the market still offers some single band Wi-Fi extenders in the high-end price range. The higher price is indicative of extra features, rather than the favored dual band frequency models. Single band extenders may go by the wayside as technology continues to advance. Wi-Fi extenders come in a wide variety of sizes, colors, and aesthetics. If you know that your Wi-Fi extender will be visibly out in the open, the color and appearance may matter to you substantially. Consider the interior style and feel of your décor. A bulkier, sleek extender with a smooth, black finish is fine for an office setting. For living rooms or bedrooms, you may prefer something smaller and less conspicuous. If you are looking to place it in a kitchen that is light and bright, a small, white unit could be your best bet, as long as it gives the speed and range that you need. Consider how far you need for your Wi-Fi extender to reach. If you need it to reach spaces larger than 300 feet, you will most likely be looking in the higher-priced range of extenders. If you only need it to extend your internet for short distances of 50-75 feet, you will be able to find a quality Wi-Fi extender in the low-to-mid priced range that performs very well. Unless you know that Mbps means megabits per second, you might not think to check it when comparing Wi-Fi extenders. This numeral refers to the speed at which your data travels. The higher the number of Mbps, the faster the data travels. For most purposes, 300 Mbps works very well. If you want the ultimate in speed, look for Mbps speeds at 1200 or higher. Some of the Wi-Fi extenders on the low end of the price range don’t have Ethernet or USB ports at all. That’s fine if all you are looking for is simple, extended range for a short distance. The more Ethernet ports you have, the more flexibility and versatility you will have to customize your system. 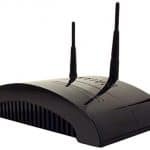 You will want to place your Wi-Fi extender about halfway between the area that has the dead spots and your router. When you find the best location, you’ll have a better idea of whether you want a desktop model, a wall-mount model, or one that plugs into an outlet. Make sure that your Wi-Fi extender does not have trailing cords disrupting the flow of traffic. You can use the wall plug extenders to get rid of the problem of hiding wires. Take note that some Wi-Fi extenders are big and cover adjacent outlet plugs, limiting the use of your electrical power for other purposes, especially if you are short on electrical outlets, in your workspace. Cost is almost always a consideration. Fortunately, there is a good range of pricing for Wi-Fi extenders. On the low-end, you can expect to pay $20-$30 for a good quality Wi-Fi extender. On the high-end, you can expect to pay $100 or more. The market has a decent offering of Wi-Fi extenders in the mid-range price at about $70 per unit. You don’t necessarily need to buy the top of the line Wi-Fi extender. You need the Wi-Fi extender that does the job that you need it to do, depending on your work or personal needs. Here are my top Editor’s Choice picks in different categories. The ZyXEL WAP3205 is my choice for a lower-priced Wi-Fi extender that gives you a lot of value for your money. Despite its small size, It has the dual band frequencies that give 300 Mbps speed and 450 feet in range. ZyXEL made room for 2 Ethernet ports in its design, unlike other smaller units that couldn’t find space to add them. You can use this unit in four different modes, and also use it as a wireless access point. The indicator lights will let you know when the unit is working well and when you need to make some adjustments. Unlike many other units, you can power it off when you are not using it by depressing the power button rather than unplugging it. Users will be happy to find that it comes with a support CD and a quick-start guide, in addition to the full manual. You can also download the full manual from the ZyEWL website. The website also includes some helpful FAQ’s as a resource for quick answers to common questions. If all that is not enough for an affordable, smaller Wi-Fi extender, you also get remote capability and a 2-year warranty. If there is an exception to getting a Wi-Fi extender with a single band, it’s the Hawking HW2R1 model. What it lacks in speed, it makes up for an extended range of 450 feet. The remote capability lets you manage all of your settings and authorizations anywhere that you are. This unit leaves many of the dual band models behind when it comes to safety and security features including firewalls, filtering options, and address translation, to name a few. In addition to these important features, it also gives you 5 Ethernet ports for adding your other devices. This unit is as easy to like as it is to set it up. My pick for a Wi-Fi extender that has the best in security features is the Amped SR300. It’s another single band Wi-Fi extender that gives a reliable performance in speed and range. The backwards compatibility lets it work with nearly all other devices, regardless of age. It gives you remote management capability for off-site management. It looks great on the desktop or mounted on your wall. It sets up easily with a WPS button or manually with your computer. The security features surpass many of the competing single and dual band units with features like WPA, WPA2, WPS, and V WEP for extra security. The middle-range price helps to make this product a contender. My choice for the best overall Wi-Fi extender is the Netgear EX6300, mostly because it has the utmost in speed with 1200 Mbps. It also gives an extended range of signal with up to 450 feet. It has five high-speed Ethernet ports and a USB port that function well with the latest technology. This unit gives the best of everything—range, speed, power, performance, and reliability. It’s likely to be a tough one to beat in the coming years. The wave of the future with Wi-Fi range extender reviews will certainly lean more heavily towards dual band units as the favored Wi-Fi extenders, though there are still some good quality single band extenders in today’s market. The range is an important thing to watch, as well as any hints of slow speeds. Security features are being increasingly developed to give users peace of mind. With plenty of Wi-Fi extenders available in all shapes and sizes, you’re sure to find one that meets your needs and your budget.